eXceptional Views | The Happy Wonderer ~ ellen b. 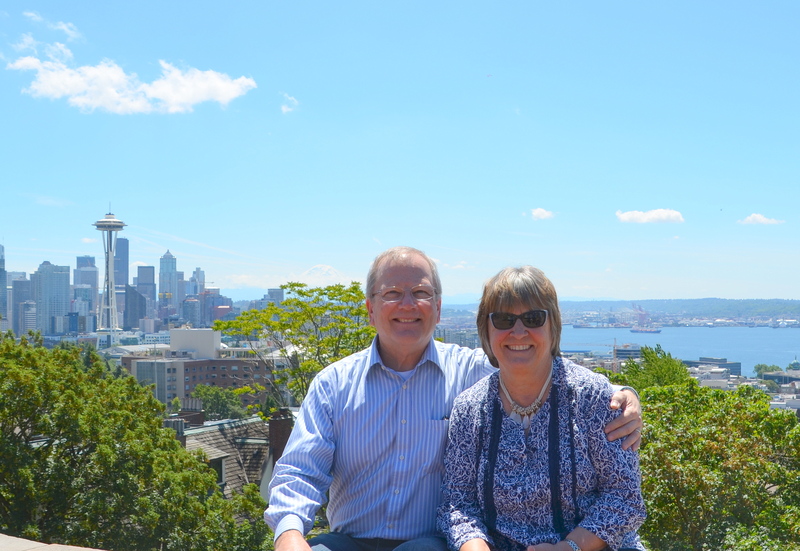 On Father’s Day after brunch in downtown Seattle we headed to Kerry Park atop Queen Anne Hill to take in these eXcellent views. 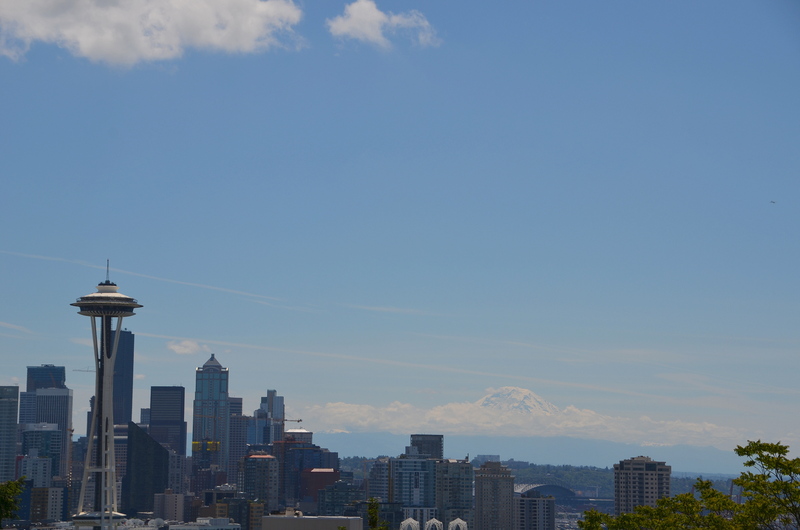 It’s great to capture both the Space Needle and Mt. Rainier together on a clear day. Both are iconic symbols in Seattle and Washington State. Mount Rainier, Mount Tacoma, or Mount Tahoma is the highest mountain of the Cascade Range of the Pacific Northwest, and the highest mountain in the state of Washington. 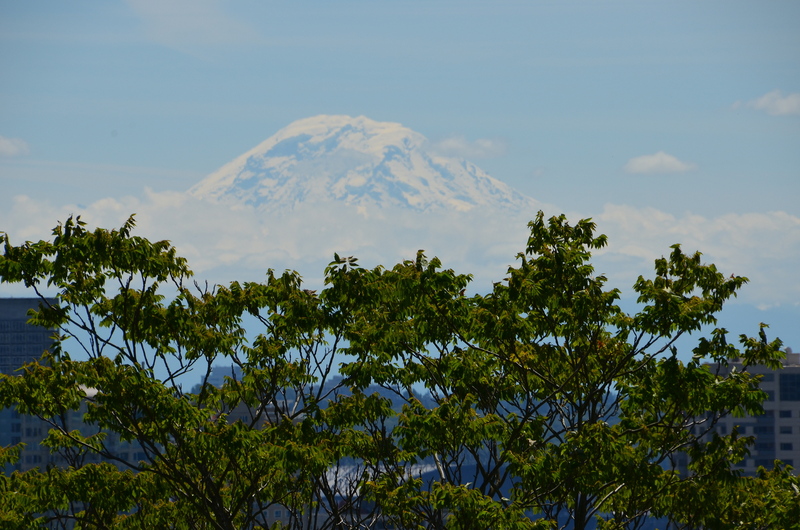 It is a large active stratovolcano located 54 miles south-southeast of Seattle. Ascending to 14,410 feet above sea level, Mount Rainier stands as an icon in the Washington landscape. An active volcano, Mount Rainier is the most glaciated peak in the contiguous U.S.A., spawning six major rivers. And on a more personal note…hope she never blows her top and annihilates all of us Seattleites! The Space Needle and Mt. Rainier are treasures in Washington State. Speaking of personal here is my eXcellent and treasure of a husband and the father of our children enjoying the iconic views from Kerry Park on Father’s day! Linking up with ABC Wednesday and Tuesday’s Treasures. Thank you Mrs. Nesbitt, Roger, ABC Team, and Tom at The Backroads Traveler for hosting these fine memes. Dear and I are eXiting the familiar and heading to roads we’ve never traveled to enjoy one of our Nation’s treasures, Yellowstone National Park. I hope to share some postcards along the way but if you don’t hear from me it’s because wifi might not be available to us. Our wonderful basement dwellers will take care of the safety of our home and water our plants while we are away. Posted on June 21, 2016 by Ellen •	This entry was posted in ABC Wednesday, Tuesdays Treasures and tagged Downtown Seattle, Kerry Park, Mt. 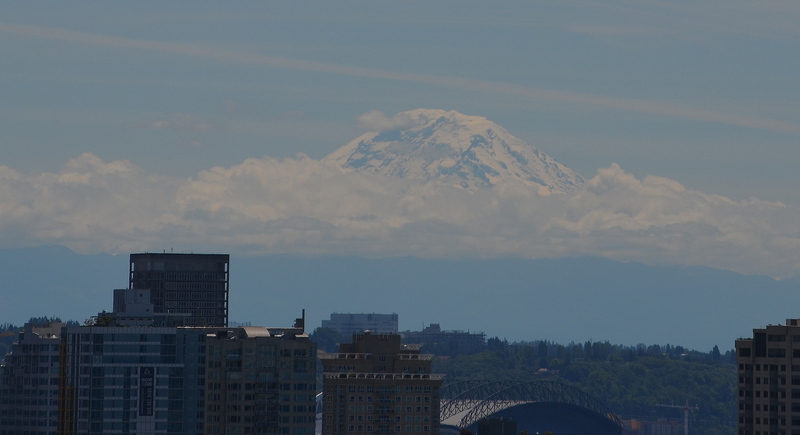 Rainier, Seattle Washington, Space Needle, Tuesdays Treasures. Bookmark the permalink. 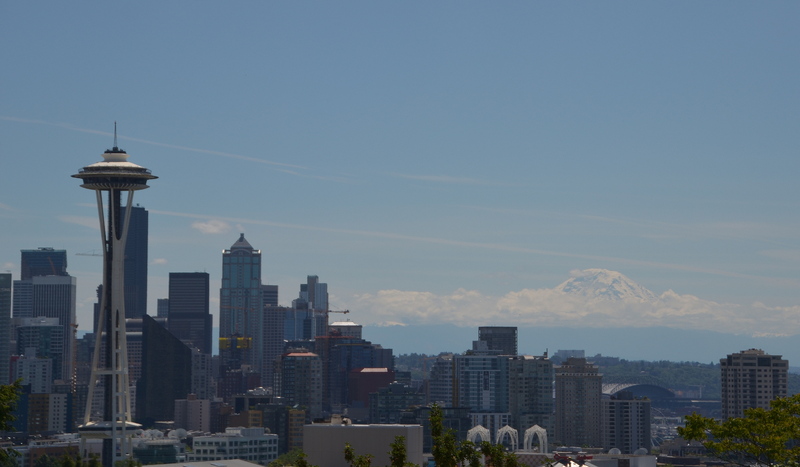 Wow but those are terrific views across Seattle to the mountains! Have a wonderful time in Yellowstone! Lovely, the view to Mt. Rainier. We went their in June and still found closed roads because of the snow. Of course both needle and Mt. Rainier are great treasures. We are Bakerites too since we live up her way. Happy wandering and yes many photos for us to see. What a lovely choice for X Ellen and indeed they are exectionel. Thank you yet again for showing the real America. I meant to tell you that I got the Mennon[te Girls can Cook, I just love it ! Thank you Di! And thanks for letting me know about the book! Blessings. Great pics of your mountains ! Enjoy your week. That is certainly crisp, blue sky- and a pleasant reminder. I used to live in Queen Anne! Lovely, – especially with |Mt. Hood in the background. H|ave a great trip! Hope you have a wonderful time on your travels! Seattle is a very lovely place isn’t it! Glad you enjoyed the day! Outstanding views. I have been in Texas but never in North Western States. Would love to visit Seattle and Washington. It’s a beautiful part of our country. You need to come and see! You are right about the views. Have a wonderful trip! The views from Seattle are amazing. Wonderful photos! Have an amazing trip to Yellowstone! That’s on our wish list someday. Ellen, thanks for sharing your smiling treasure! We all have so many treasures in our lives, we only need to stop and count them. I hope that you stop back soon. Beautiful photo of you both. A real treat for me to see the breathtaking scenery around your part of the country. Beautiful pictures of your beloved city! Enjoy Yellowstone – a place we’d love to see someday. Looking forward to your “travelogue” of this amazing place. Safe travels…. Beautiful view. Have a happy day! Great pics.The mountain backdrop is awesome. I’m glad you have basement dweller available to help in your absence. I shudder to consider what my ‘basement dwellers’ might do to my place! Almost a mirage. Great shot!